The generation of ions during high energy laser ablation has already in the early 1960s been utilized in fundamental1 and analytical purposes2. The advent of new laser technology, femtosecond lasers in particular, makes this approach attractive again for analytical purposes. This technology, however, leads to ions with a broad initial angular and energy distribution, which makes transmission to the mass analyzer a challenge. In this work we investigate a novel laser ablation ion funnel (“LAFU”) ion source, in order to exploit laser generated ions for spatially resolved elemental and isotope analysis of solids. The ion funnel was first described by Shaffer et al3 to improve ion transmission in electrospray ionization mass spectrometry and is based on the theoretical work of Gerlich4. Briefly, it consists of stacked ring electrodes with decreasing inner diameter towards the mass spectrometer orifice. Radiofrequency (RF) power is applied to the ring electrodes at alternating phase (180° shift) between adjacent electrodes. Classically a DC gradient is superimposed on the ion funnel to drive ions across the funnel; in the here developed setup the DC gradient is avoided and the transmission relies solely on the gas dynamic effects produced by a convergent-divergent supersonic (CD) nozzle placed between the sample and the ion funnel. In addition to spatial focusing, the kinetic energy of the ions in the funnel is dissipated through collisions with a buffer gas (e.g. He) during their transit through the ion funnel. 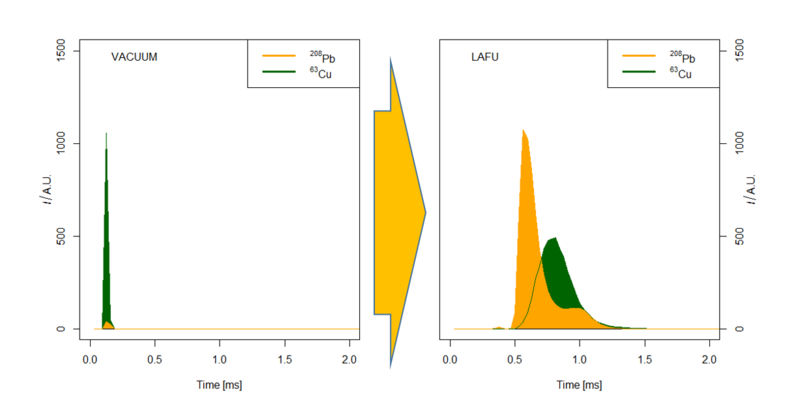 Initial results with the “LAFU” ions source show for the first time that low m/Q elemental ions can be successfully focused in an ion funnel. Overall the transmission efficiency could be increased up to 200 times in comparison with ablation in high vacuum. Still the ion transmission through the ion funnel showed a pronounced dependence on m/Q, as a result of the pseudostationary fields created near the ion funnel electrodes. A parametric studies was performed using Brass standards to assess the influence of the operating condition used. Low m/Q species have better transmission with lower RF amplitude and higher Frequency, conversely behavior is found for high m/Q species. R. E. Honig, Appl. Phys. Lett., 1963, 3, 8. N. C. Fenner and N. R. Daly, Rev. Sci. Instrum., 1966, 37, 1068–1070. S. a Shaffer, K. Q. Tang, G. a Anderson, D. C. Prior, H. R. Udseth and R. D. Smith, Rapid Commun. Mass Spectrom., 1997, 11, 1813–1817. D. Gerlich, State-selected state-to-state ion-molecule React. Dyn. part, 1992, 1, 1–176.